Ronald Acuña Jr.'s eight-year, $100 million extension includes two club option years that could push it to $124 million in value. ATLANTA — There was no question in Alex Anthopoulos mind — or anyone else’s for that matter — of Ronald Acuña Jr.’s talent after watching the can’t-miss prospect turn into a Pheñom during his National League Rookie of the Year run. But what the general manager wanted to see as the Atlanta Braves considered making a huge commitment to the 21-year-old was how he’d handle it. 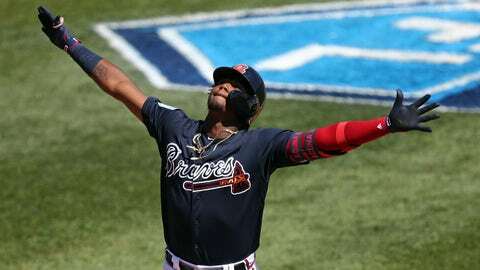 The words of those around him, and the potential of Acuña’s peak years coming in a Braves uniform was enough for both sides to agree upon a record-setting eight-year, $100 million contract. The deal also includes a $10 million buyout and two club option years and that could push it to 10 year and $124 million. Acuña, who had his family and teammate Freddie Freeman seated in a press conference at SunTrust Park, was given the largest extension ever for a player with as little service time as the left fielder has (165 days). The deal trails Freeman’s $135 million deal for the largest in Braves history. And nobody could be happier than the Braves, considering how club-friendly this contract stands to be. Acuña was scheduled to make $560,000 this season, but will make $1 million in both the 2019 and 2020 seasons. He’ll then jump to $5 million in 2021, $15 million in 2022 and $17 million in 2023 through the remainder of the contract. That gives him an average annual value of $12.5 million, which to put into the context of 2019 salaries, has Acuña — coming off a 3.7 fWAR season — in line with the likes of the Orioles’ Mark Trumbo (0.3 fWAR in ’18), the Cardinals’ Andrew Miller (0.4 fWAR) and Giants‘ Brandon Crawford (1.9 fWAR). Even the high end of Acuña’s deal — those $17 million seasons — has him in line with the current compensation of Red Sox’s Nathan Eovaldi, Yankees’ J.A. Happ and Cardinals’ Miles Mikolas and just ahead of Freeman ($16.875 million) — from the steal of a contract he inked in 2014. We haven’t even begun to factor basic inflation that at a three percent rise could make $17 million in value in 2019 dollars nearly $21 million by the time Acuña is into his club option years. So Acuña, in his age 25, through potentially his age 30 season, will be making a figure that’s currently surpassed by 54 players. To put that up against the contract signed by one of this offseason’s most sought-after free-agents, the Padres are on the hook for $30 million a year for Manny Machado — $13 million more than Acuña’s due — and San Diego has him until he’s 35. Acuña stands to hit free agency as early as 29 or by 30 if the Braves pick up his options. That’s the steal that Anthopoulos pulled off in buying out the arbitration years and first two years of free agency for a player that we likely haven’t even seen the best of yet. Acunã hit .293/.3566/.552 with 26 doubles, for triples, 26 home runs, 16 steals and 143 wRC+ in his first season, the 12th highest wRC+ of any rookie since 1980. Financial flexibility became a touchy term amid an at times difficult winter for fans to watch unfold, but it’s one that Acuña’s deal should make a happy reality. The Braves jumped into the extension pool and secured a generational talent, and they managed to do it without hamstringing themselves for the future. They inked a likely MVP candidate for years to come to a contract that doesn’t crack the top 40 among current deals.